Many of AAOM's members in the Oral Medicine community are involved in research and publications. AAOM publishes a collection of clinician's guides to topics in Oral Medicine. The authors and publisher have made every effort to ensure that the patient care recommended herein, including choice of drugs and drug dosages, is in accord with the accepted standard and practice at the time of publication. However, since research and regulation constantly change clinical standards, the reader is urged to check the product information sheet included in the package of each drug, which includes recommended doses, warnings, and contraindications. This is particularly important with new or infrequently used drugs. Any treatment regimen, particularly one involving medication, involves the inherent risk that must be weighed on a case-by-case basis against the benefits anticipated. The reader is cautioned that the purpose of this book is to inform and enlighten; the information contained herein is not intended as, and should not be employed as, a substitute for individual diagnosis and treatment. 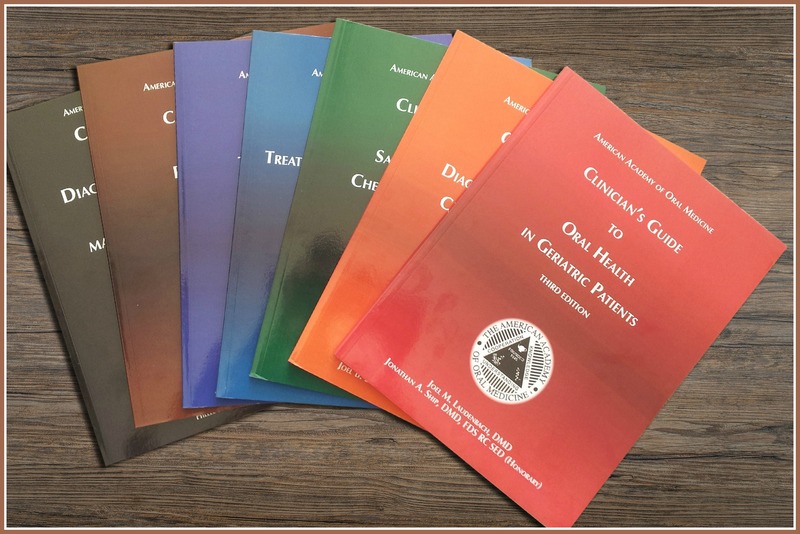 The AAOM Clinician's Guides are sold through Amazon. Oral Surgery, Oral Medicine, Oral Pathology, Oral Radiology is published by Elsevier for the American College of Oral and Maxillofacial Surgeons, American Academy of Oral and Maxillofacial Radiology, American Academy of Oral Medicine, American Academy of Oral and Maxillofacial Pathology and Sociedade Brasileira de Estomatologia e Patologia Oral. 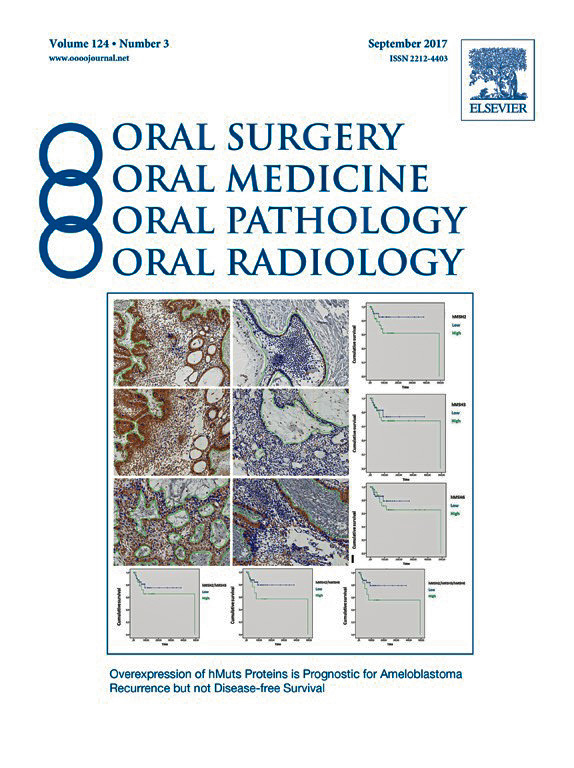 The OOOO Journal (Oral Surgery, Oral Medicine, Oral Pathology and Oral Radiology) is required reading for anyone in the fields of oral surgery, oral medicine, oral pathology, oral radiology or advanced general practice dentistry. It is the only major dental journal that provides a practical and complete overview of the medical and surgical techniques of dental practice in four areas. Topics covered include such current issues as dental implants, treatment of HIV-infected patients, and evaluation and treatment of TMJ disorders. The official publication for four societies, the Journal is recommended for initial purchase in the Brandon Hill study, Selected List of Books and Journals for the Small Medical Library. The Journal is ranked 43rd of 87 journals by impact factor in the Dentistry, Oral Surgery and Medicine category on the 2014 Journal Citation Reports®, published by Thomson Reuters. The online Oral Surgery, Oral Medicine, Oral Pathology, Oral Radiology library contains articles from 1948 to the present. Access to tables of contents and abstracts is complimentary, while access to articles is limited to print subscribers. AAOM members receive a complimentary print and online subscription as part of their annual membership. The Academy is an affiliated organization of the medical journal known as OOOO Journal(Quad-O), Oral Surgery, Oral Medicine, Oral Pathology and Oral Radiology. Additionally, AAOM's members receive periodic newsletters with events and other coverage of goings-on in the field. *Please note: We are unable to ship hard copies to Saudi Arabia.